- A few days ago Matt sent a group message asking a few fellow hikers if we were interested in meeting up for a hike. When I found out that he, Patrick, Theresa, and Denise were hiking my favorite trail up Mount Moosilauke, the Beaver Brook Trail, I jumped at the opportunity for an early spring hike up the first 4,000 footer in New Hampshire that the Appalachian Trail crosses over. - The Beaver Brook Trail, for me, is the most exciting and difficult way up to Mount Moosilauke. The trail is very steep from the get go and doesn't let up until about a mile and a half in. The footing is rough and rugged, similar to the terrain found in the Presidential Range. Luckily for us there was still plenty of snow burying all the rocks, and even better was the snow pack was solid enough that we left the snowshoes in the car and just wore microspikes and hill sounds! - Today's hike was a much needed change from the sub-par weather conditions I had during my three previous hikes up Moosilauke. Last May, Rachel, Scott, Isis and I bushwhacked the old Beaver Brook Trail to the summit through thick clouds and drenched overhanging trees. In early December, Whitney and I almost got blown off the summit by the ferocious west winds via the Glencliff Trail and Carriage Road. then, a few months later in late January, Alton, Kara, Sasha, Cole Fancy Pants Panda Bear and I hiked in frigid temps up the Beaver Brook Trail into high winds and low visibility! Today was a different story, it was warm with tremendous views, for the first time since October I didn't have to wear a hat or gloves or winter boots! - Once above the steeps we stopped for a break at the lean-to. It's a very popular place to stay with it being right off the Appalachian Trail and there is a great view across to the Franconia Ridge. - Once past the lean-to the trail eases up a lot as it heads just below the summit of Mount Blue and then up to the summit of Mount Moosilauke. - We made it to the summit around noon and were in complete shock as the orange summit sign was gone. None of us knew if it was being replaced by the Dartmouth Outing Club or if it was stolen by a hiker. - We took a nice long break on the summit, the wind was light and variable, it was a little cool so we all put on a layer to stay warm until we were back below the trees on our descent. 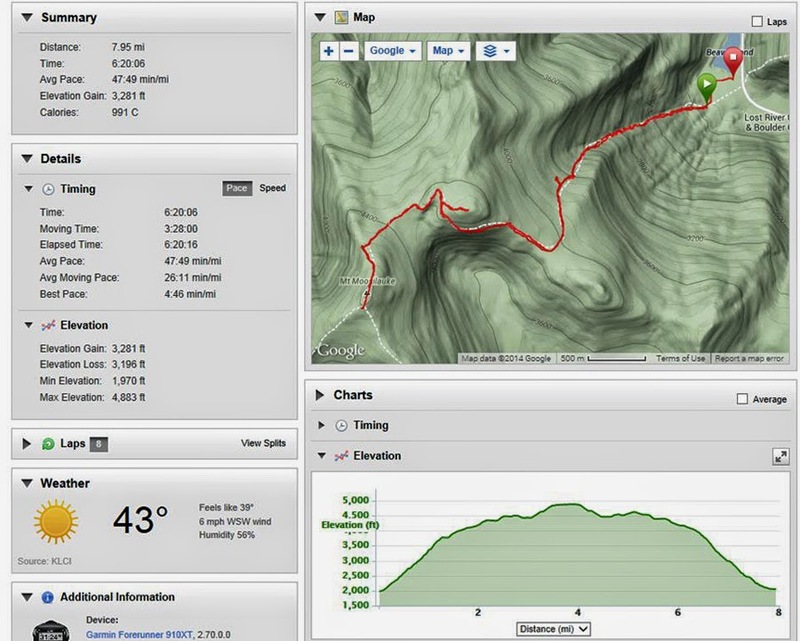 While at the summit two other hikers came up, one up the Gorge Brook Trail and another from the Beaver Brook Trail. - The descent down was a lot of fun, along the way we made a pit stop up to Mount Blue, I had never been and didn't know how to get there. Matt had his GPS trek of it in case we needed it but we were able to find the summit with no issues and more importantly we didn't post-hole too badly. Mount blue's summit has a jar with some candy bars and a note pad in it. It was pretty cool to bushwhack to the summit. I had never been up it so it was a mini adventure, next time I hike the Moose I'll head to Mount Jim, another sub summit off the Asquam Ridge Trail! - After Mount Blue we headed back down the steep section, Matt lead the way through most of it kicking in some steps when needed. The re-bar section was a little tricky to navigate on the way out but we all made it safe and sound and then cruised to the trailhead making it back to the car around 3ish. - It was a great day hiking, I finally got views from Moosilauke for the first time in two years and it was nice of Matt to invite me along. After the hike I went into Lincoln to get a jump on some work that came in before heading south and catching sunset in Windham (southern NH) before finally making it back to RI around 10 p.m.
Fist time and a long time for views on the Moose! Bare ground above treeline, spring is here! The gang breaks out above treeline! The Appalachian Trail heads north over everything in this picture, Kinsman and Franconia Ridges! A long time ago a plane crashed on Mount Moosilauke, I have yet to check this out, another thing to add to the list of hiking adventures! Where was that kiosk sign of the Bomber info? When I went in to see it, it was off an old logging road and there was no info on the wreckage or story. Here's may old trip report from before I even had a blog if you're interested: http://www.hikenewengland.com/WaternomeeB18CrashNH091010.html It's a humbling place. Karl, thanks for sending the link, awesome stuff and this is just what I needed to know how to get to the wreckage site! The bomber kiosk was at the Beaver Brook Trailhead entrance to the right just as you pull in.